I started by killing innocent traders and scavengers because I couldn't find any Police Moths around. I decided to make it a test to see how many innocents I could kill before a Hardwar day went past and the Police would send Enforcers out after me. I killed 30 traders and scavengers and had quite a bounty. My fine was over $100,000 as shown in the message below. Click the pic for a full sized view in a separate window. The Police came after me one at a time until I killed the first six. Then they came in pairs for a while. Ultimately, they come in threes. They're armed mostly with Swarms and Underkills, as well as the usual Plasma Kannon, Laser Turret, and Laser. Once the trios started coming, things really got hoppin'. They used UnderKills extensively and I lost my CPU and software almost every confrontation. I made a habit of going from hangars I owned in Gamma, Downtown, and Highrise. I had these stocked with every piece of Chaff, and all of the Groundbase I could find. I was also outfitted with Plasma Kannon, Laser Turret, and Laser. 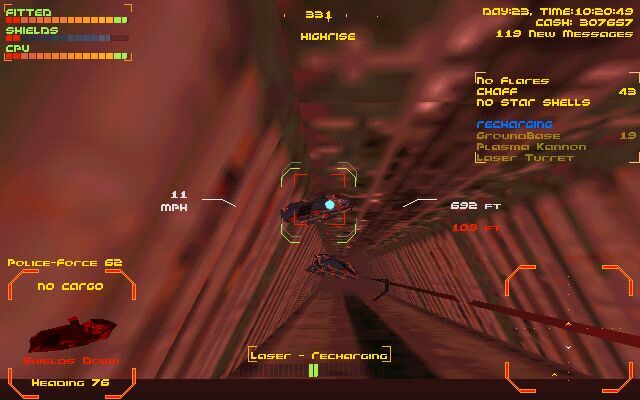 Big Note: -- Police Moths can and do fire missiles in tunnels. I'm not sure why they can and others can't, but don't forget this when you try playing this type of game yourself (and you know you will). I did not use the God Hangar, but I did take plenty of time to prepare. I began with a great saved game where I already had a Police Moth. I stocked weapons dealers and component shops to get the Groundbase and Chaff I thought I'd need. My basic strategy, once the trios started attacking, was to hang with one until that one was dead or I'd have to escape to save my bacon. 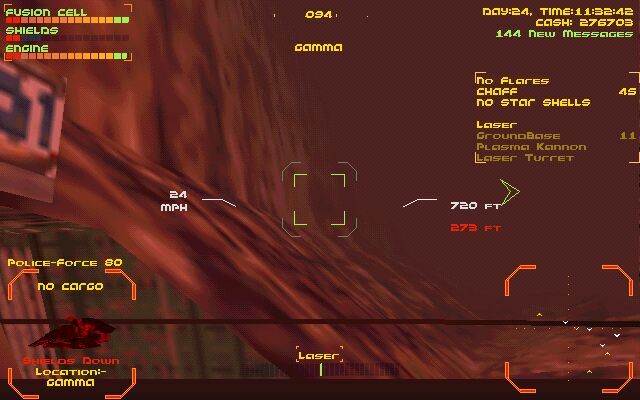 Then I'd run to one of my hangars in another crater, repair and stock, target another Police Enforcer, and attack. This plan was slow, but I got through 80 Police Enforcers without dying or resorting to the God Hangar. I made extensive use of tunnels to try to get all three Enforcers in a trio in one blow. The pic below shows two Enforcers that fell into such a trap. They died. I bumped the top one into the bottom one bringing both to a dead stop -- sitting ducks. Click the pic for a full sized image in a separate window. The game ended when I killed the above Enforcer, went to top my shields and flew back through the Gamma/Downtown tunnel. 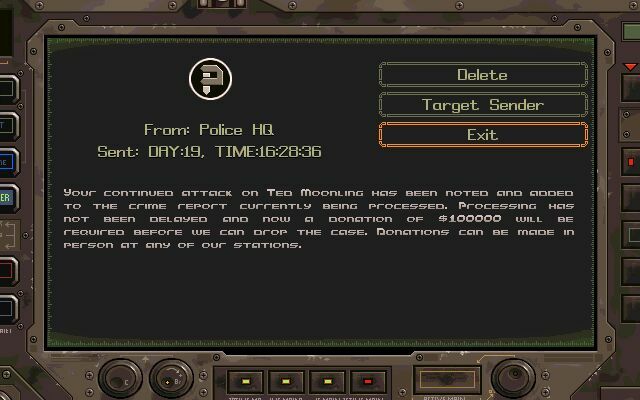 I targeted Police Enforcer 81 when the error message arrived. I met a new AI trader in this game. Her name was Jazzmin Drady. I was too busy to kill her this time around, but I'm sure I'll get around to it eventually. I'm going to try to get this game to work again and I'll report back what I find.